Directed by Makoto Shinkai, Your Name is an animated, feature-length romance film with supernatural overtones that balances these two genres with delicate ease. The film follows Tokyo high schooler Taki and the rural town girl Mitsuha, paralleling their morning routines, the wistfulness of their lives, both of them wondering what the future holds for them. Early into the film, an element of mystery puts a wrinkle in the two teenagers’ mundane lives when their friends and family comment on their odd behavior, which the viewer has not yet seen. Their lives are completely twisted when they wake up in each other’s bodies, and the memories of the other’s actions in their own bodies fade like dreams. The plot of Your Name moves slowly at first to build the atmosphere of mystery, drama, and a bit of comedy, then accelerates when Taki and Mitsuha get used to each other’s lives, and an effective midpoint is reached when Taki wakes up as himself and can’t remember or contact Mitsuha in any clear way. He and two friends travel to her lakeside home town, Itomori, and what they find there drives the last third of the movie with breathless action, drama and longing. Your Name‘s animation, voice acting and overall production values are top-notch, with richly-detailed and colored backgrounds, distinctive and expressive characters, and finely-rendered CGI elements, mainly in the sky. Taki’s and Mitsuha’s longing for each other, and their confusion and frustration at the supernatural barriers between them, create palpable tension and strong emotional resonance with the viewer. Once the movie’s plot picks up, all these elements blend tightly together, just like the threads of fate that the movie often references. 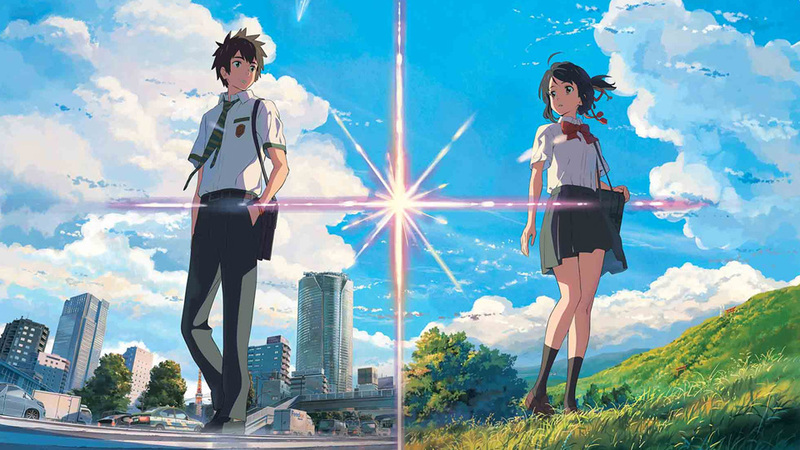 Aside from its supernatural trappings, Your Name‘s core plot is a standard one of separated lovers who slog through life’s obstacles to unite, and the ending is a fairly conventional one after all the mysteries and fantastical elements are explained and resolved. Still, Your Name‘s thematic use of the supernatural, love and fate make for a thrilling and intimate adventure. Ghost in the Shell has the visual punch, gleam and grime appropriate of the source material, but the thin plot and watered-down main cast hold it back from being the visionary cyberpunk magnum opus that it could have been.